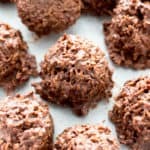 4 Ingredient No Bake Coconut Macaroons (V, GF): a one bowl recipe for perfectly sweet no bake macaroons bursting with coconut flavor. Paleo, Vegan, Gluten-Free, Dairy-Free. Ahh… Mondays. Don’t they call for something sweet? Don’t they basically NEED something sweet? Ya know, to soften the blow of it being Monday. And if that sweet something is super, ridiculously easy to make and comes together in just a few minutes? 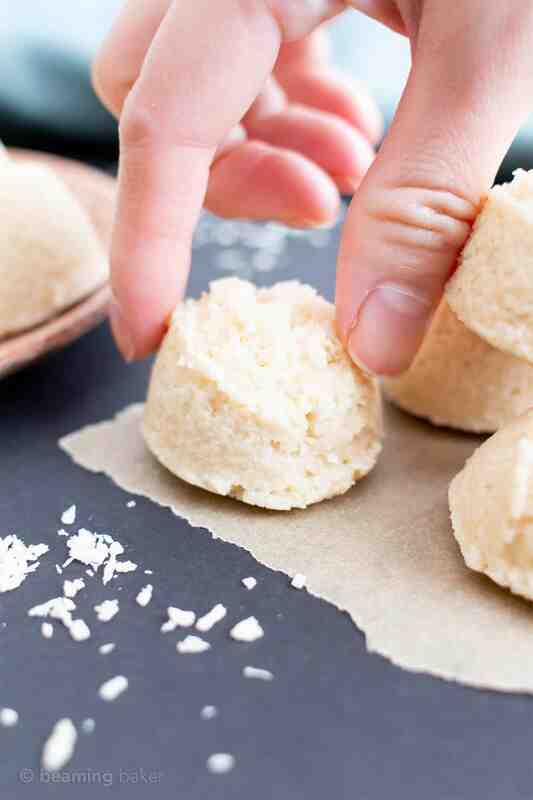 You can even skip the baking involved in my 4 Ingredient Paleo Coconut Macaroons Recipe. ‘Cuz sometimes, ain’t nobody got time for baking (esp on Mondays). So gather ‘round, all of my fellow No Bake Lovers’. 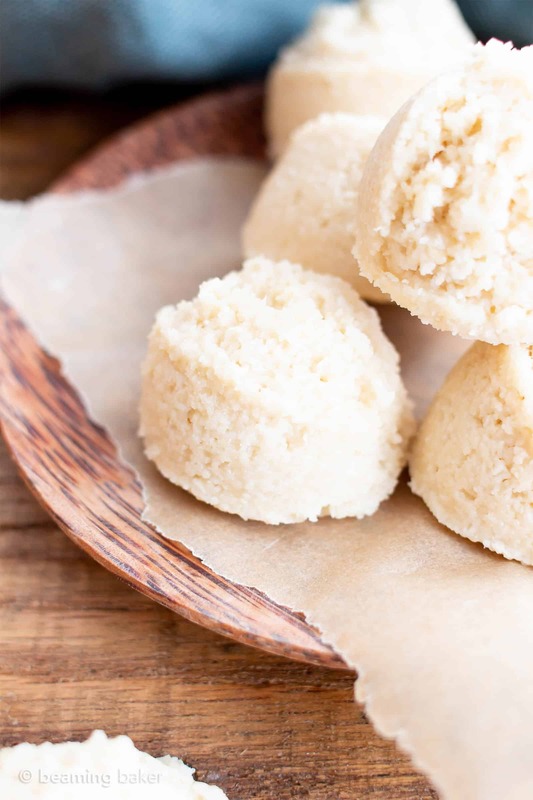 I have something truly special for you: 4 Ingredient No Bake Coconut Macaroons. Yep, I said it. No Bake. Coconut Macaroons. Woot woot! They’re just the perfect way to kick of a sweet week, full of easy wins. (Here’s hoping!) 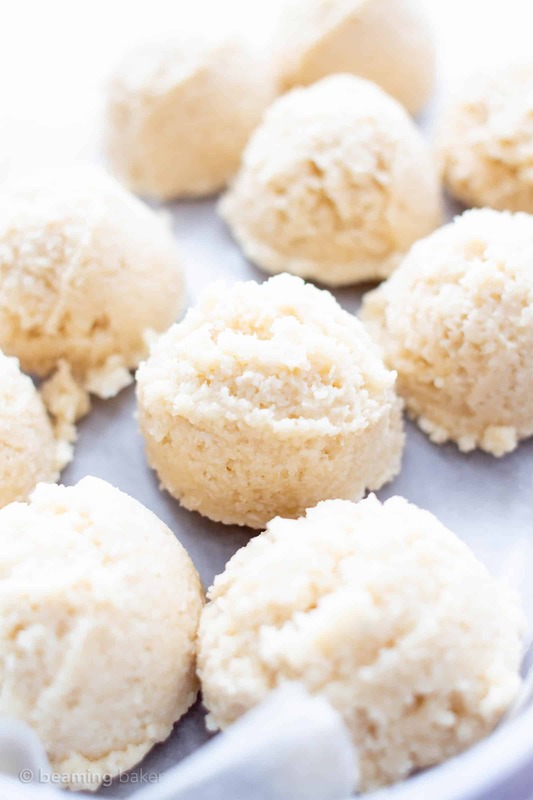 My mom, the official Coconut Expert on the Beaming Baker team, has already deemed these4 ingredient no bake coconut macaroons sooooo good, so wonderfully cool and satisfying, and just perfect for the summer. And if mama likes them, then they’re friggin GOLD. (Man… I don’t know what it is about Mondays that has me shouting…) ???? 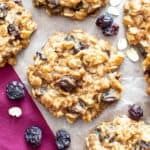 Just add everything to a food processor, blend, blend a bit more, scrape the processor down, blend a tad more, then scoop and drop onto a prepared baking sheet/plate and chill. Before you ask, here’s the food processor that I use. 😉 Lots of folks have been asking on Instagram, but it’s kinda hard to do the whole link thing there… bugger! That’s all, folks. And that’s what I call a Monday WIN. 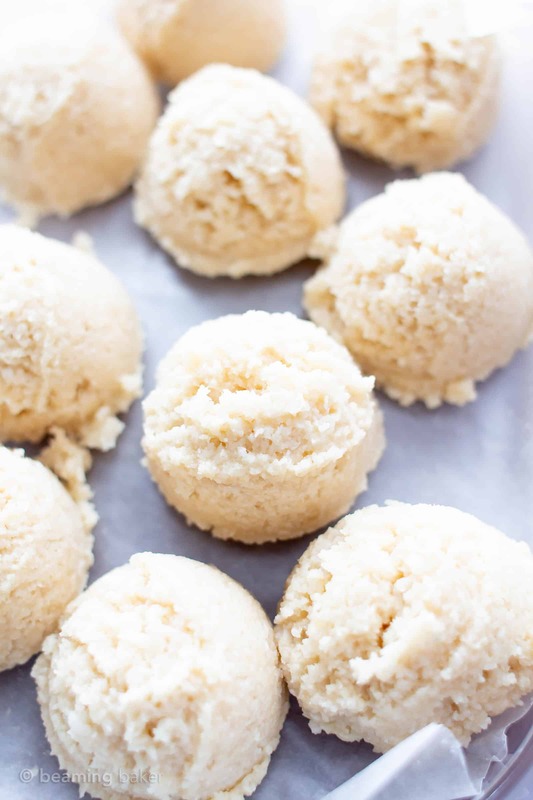 They’re BURSTING with coconut flavor, the perfect balance between soft and dense and so incredible when chilled (think: ice cream bon bons, but minus the ice cream… okay, forget I said that!! Hehe). come together in just 5-10 minutes, depending on fast of a scooper you are! 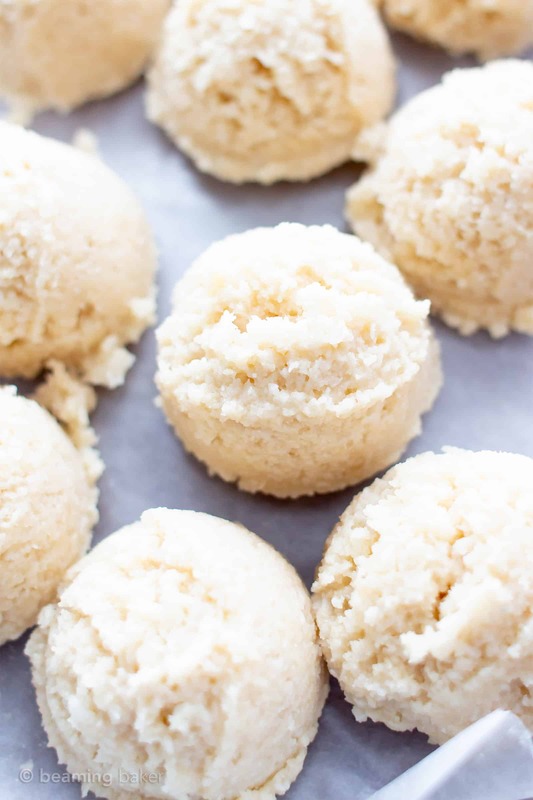 FULL of COCONUT flavor… they’ll seriously ruin you for those regular macaroons! So whaddya waiting for? My mom to come over and guilt you into trying these? 😉 J/K! She’d probably trick you into making them, then “generously” offer to take them off your hands. I’ll grab the coconut, you grab the cookie scoop. Let’s no bake this! It’s such a joy to bake and share in these wonderful kitchen adventures with you. I seriously can’t wait to hear what you think. In the meantime, make sure to sign up for my free email list so you don’t miss a recipe! ???? 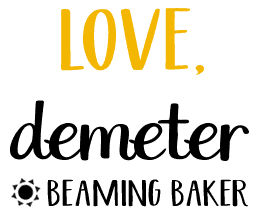 Sign up for the Beaming Baker Email List Here ???? Add all ingredients (coconut, almond flour, oil and maple syrup) to a food processor. Small coconut flakes are preferable, since large flakes will result in moister and softer macaroons. Here are the gluten-free small coconut flakes that I use. Blend until you get a wet and sticky mixture, with smaller, but still noticeable coconut pieces. If any maple syrup remains at the bottom of the processor, fold into dough until well mixed. 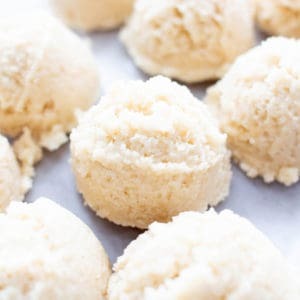 Using a cookie scoop, scoop firmly packed balls of coconut mixture. Here are the 1-tablespoon cookie scoop and 2-tablespoon cookie scoop I use. Drop onto the prepared baking sheet, making sure to space balls evenly apart. 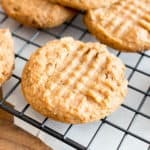 Place baking sheet into the freezer for 10-15 minutes, or until cookies are firm. Enjoy! Storing instructions below. - *Small coconut flakes are best for this recipe, but large coconut flakes will work too. 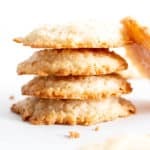 With the large coconut flakes, the macaroons will be more moist and soften quicker at room temperature. Keep them in the refrigerator. - Storing instructions: the first day, macaroons are best kept in the refrigerator. After that, macaroons are fine to store at room temperature (if you used small coconut flakes). Always store in an airtight container, in a cool, dark environment. - If freezing, store in an airtight, freezer-friendly container for up to 1-2 months. Allow to thaw for 10-15 minutes before enjoying. 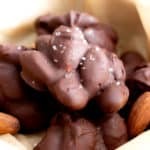 - More Paleo Vegan Recipes: no bake paleo brownies, mounds cups, chocolate coconut candy clusters. These look so good! And I love no bake desserts in the summer when it’s too hot to heat up the oven! I got to try out these coconut macaroons! They look so good and so easy to make too! These looks so awesome! My husband loves macaroons so I’m definitely making these! Thanks Shanika! Hope you and your hubby enjoy them! I’m with you on sweet Mondays! These macaroons sound incredible – and so quick. Haha oh yeah! On Mondays, you gotta have something sweet. ???? Yum! Definitely the perfect way to start a Monday. I love how easily these macaroons come together. Hi! Can you add to this recipe? I’m wondering specifically about raspberry powder or extracts. Thanks! 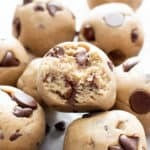 Wow these look so tasty I can’t wait to make these for the family! These look delicious!!! Do you think they would work using coconut flour? I tried them with coconut flour… and all I can say is MMMMM!! These macaroons were DELICIOUS!! And so fun to make!! Thank you for the great recipe! How much coconut flour did you use…I want to try them that way also. These look so light & fluffy! Looks like such an easy recipe too! These look great! I’m going to try one hatch with lemon zest added and one with almond extract ???? Oh YUM!! Let me know how they turn out. They sound amazing already! When a recipe is this easy and looks so delicious, it’s a definite must make! Yum!! 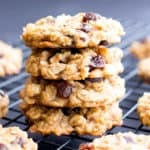 Yes I LOVE no bake cookies!! The texture is amazing, and love how I have all of these ingredients on hand too! YES!!!! There’s nothing easier right? 🙂 Hope you get to try! 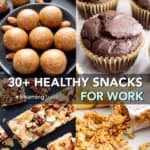 Great idea, these sound so yummy! This looks like the perfect summer treat! Bonus for no baking. It really couldn’t get any easier than this! Love it! Hi. 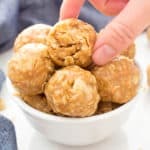 My kids have been wanting to try something like this, and these look amazing! 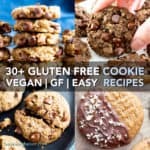 I have three with nut allergies, so what other GF flour can you recommend as a substitute?